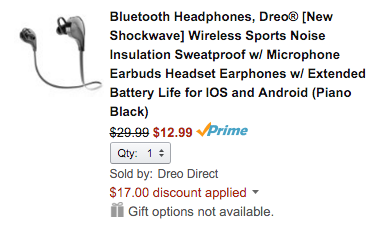 DreoDirect via Amazon offers its Bluetooth 4.0 Sweatproof Noise-Isolating Earbuds in black or green for $29.99. Applying coupon code 2JXNJM7O drops the final price to $12.99 Prime shipped. That’s a savings of $17 off the regular going rate and the best price currently available. Features include Bluetooth 4.0 capabilities, a sweatproof design, noise isolation and up to eight hours of playback. Rated 4.3/5 stars by 161 Amazon reviewers. Woot is offering the Natural Fitness Powerhouse Yoga Mat for $14.99 plus $5 flat rate shipping on your entire order. That’s as much $10 under some listings, about 20% below the original listing, $5 under Amazon, and the best price we can find. This PVC-free mat features easy-to-clean cell foam and provides “the ideal amount of support” for yoga/pilates/more and measures 24 x 72 x 3/8-inches. Just about all of the Natural Fitness Powerhouse mats have 4+ star ratings on Amazon. Head below for more Natural Fitness deals. The Powerhouse Mat from Natural Fitness is designed for fitness floor exercises and stretching. Unlike typical foam exercise mats, this Powerhouse Mat is made from non-toxic foam material which does not contain PVC, halogen, or phthalates, making it safer for both the user and the environment. The mat measures 24 by 72-Inch and 3/8-Inch thick.